Buy the sea is honored to be aligned with the best cruise lines, resorts, and destination management companies throughout the world. Royal Caribbean, Celebrity Cruises, Crystal Cruises and many more. Buy the sea is honored to be aligned with the best cruise lines, resorts, and destination management companies throughout the world. These relationships allow us to provide you with incentive-quality products and exemplary service. The support of our industry colleagues is priceless to our team and to yours. We never underestimate the value of solid partnerships. 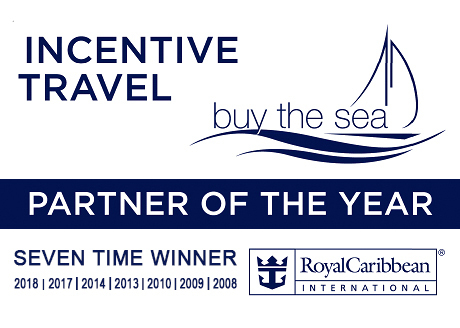 "Buy the Sea has been a long-standing partner of Royal Caribbean International and, for the fourth time, has been recognized as our Corporate Incentive Partner of the Year. This dynamic team of ladies has incredible knowledge of the cruise industry and is passionate and committed to delivering exceptional experiences for all of their clients. We have a terrific partnership, they are amazing advocates of our brand and we are thankful to have the opportunity to work closely with them to deliver the WOW on all of their client programs." "Shari Wallack and her team at Buy the Sea are true professionals, who always go the extra mile for their clients. In addition to knowing all the cruise line ships inside and out, they're also a tremendous resource on 'how the process works' when having a meeting or incentive program at sea. Buy the Sea is a multiple time recipient of the prestigious Celebrity Cruises Corporate Meeting & Incentives Account of the Year Award." "If you want to save time and receive invaluable unbiased information when purchasing cruises for your incentive clients, Shari Wallack is the one to contact. She is a no-nonsense go-getter who knows how to match cruise products with client needs." "Shari Wallack is a respected incentive travel professional. Her expertise, persistence and charismatic style are well known throughout the cruise industry. Shari has proven to be an important resource to many clients." "Having worked with Buy the Sea for many years, I can attest that they are tireless in their efforts to source the best cruise options for their clients, while at the same time maintaining quality partnerships with the cruise companies they present. By offering unbiased consult to group, charter and incentive customers, they are able to provide clients the best ship, on the best itinerary, at the best price. They also work as consistent advocates for those of us in the cruise industry who compete with the enormous variety of travel options available to meeting and incentive clients these days. It's a pleasure working with the professional cruise consultant/planners at Buy the Sea!" "MSC Cruises has been blessed to be partnered with buy the sea in developing great cruise experiences for the corporate and incentive market. Working with professionals like Shari Wallack and her team ensures that clients will be informed about the perfect cruise program and will be extended the best value in travel today. Having now had many groups cruise with MSC that were exceptionally organized by Buy the Sea, I know why clients respect their services and professionalism. They do a great job!" "Regent Seven Seas Cruises, Oceania Cruises and Norwegian Cruise Lines have a great working relationship with Shari and the Buy the Sea team. Their product knowledge and passion for the business are exemplary, and translate into successful programs and happy customers. We look forward to many more years of successful partnering with Buy the Sea." "Through hard work, dedication and non-stop energy, Shari is well-deserving of the respect she has in the incentive travel industry. Holland America Line holds our partnership in high regard and will continue to grow that relationship. The entire team at Buy the Sea is professional, detail-oriented and a pleasure to work with." "It is a pleasure working with the team at Buy the Sea. They are a good business partner and we are grateful for their support to Paul Gaugin over the years. They have great industry knowledge and can match the right product to a client's specific needs. You can trust their recommendation to deliver as promised." Valerie Matalon, CMP - Senior Account Executive, Hello Florida! "We are thrilled to collaborate with Buy the Sea. We appreciate the referrals and have been exposed to several new clients thanks to their endorsements. Partnering with Buy the Sea allows us to seamlessly execute successful programs." "We at DDP love working with Buy the Sea for their top notch professionalism, renowned ethics and dedication to proposing businesses and destinations. To summarize, great people that make a great company." "We have known and worked with Buy the Sea for several years now, and it has always been a pleasure to deal with them. They are very professional and incredibly detail oriented. They have a very 'Hands On' approach with their clients' business." "Our company works very closely and effectively with Shari and her associates at Buy the Sea. We enjoy every minute of it! We are able to combine our expertise in the Incentive and Corporate Travel Industry in order to be a key asset to our mutual clients." Aristides Tsaldaris, President & CEO, Horizon Travel S.A.
"Each day in Horizon, we strive to provide creative solutions with the highest level of service for our clients. We have found the perfect partner in the name of buy thesea to whom the attention to detail is unparalleled and has earned us prestigious quality certificates. 'People drive success' is for sure the motto of Buy the Sea, and how lucky are we." "Working with Shari and her team at Buy the Sea over the years has been a true pleasure. Shari is a real pioneer, being one of the first to offer Panama, always looking to offer different and exciting products to her clients. She and her team get very much involved with the hotels they work with, hand in hand with both the sales and operations departments to ensure the success of all programs from beginning to end."